Is this bad? Many of us think so. In surveys that ask people to list what they did the day before, and to rate it as time well spent or as wasted time, most people rate the time they spent reading as time well spent. Most people rate the time they spent hanging out with friends as time well spent. 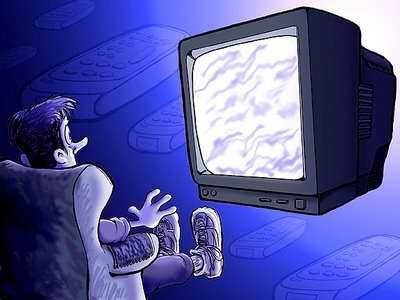 Most people rate the time they spent watching television as wasted time. From the vantage of just one day later, we see ourselves as having not made the choice we wish – a day later – that we had. It’s no easy thing in this postindustrial, information age world to connect with ourselves – to recognize in the moment what our deeper wish is, the wish that a day later we are able to recognize if asked. In the moment, it’s just so easy and inviting to flop back on the sofa and reach for the remote. And sometimes that is time well spent. It’s just that more often it isn’t. What we really wanted to be doing was something else, but we weren’t connected to ourselves enough to hear our truer wish. We always have a part of ourselves that is quietly watching and is providing us with guidance. Often, we are not as in touch with that part as we could be. We do talk to ourselves. Pretty much everybody has inner dialogs. We give ourselves instructions that are really helpful and important. Keep running, stop eating, get out of bed. Here's an experiment that illustrated the functioning of one inner voice. In a simple test of impulse control, participants sit at a computer, and if a certain symbol appears on the screen, they are to press a button. If any other symbol appears, don’t press it. The computer is programmed to flash the “press” symbol most of the time, so that becomes the impulsive response, and we have to take care not to press when the other symbols flash. When I say “take care not to press,” what that actually means is listening to an inner voice that says, “no, not that one.” We know this because scientists found a way to block the inner voice. They told participants to repeat one word over and over as they took the test. This prevented them from talking to themselves while doing the test. The result was that impulsivity took over – there was no inner voice to hold it back. We rely on an inner voice to guide us through our day. Ah, but which one? If all you need from the inner voice is to keep saying, “don’t press the button if it isn’t the right symbol,” there’s usually not much problem. The thing is, we spend our days negotiating situations much more complex than following one simple criterion for when to press and not press a button. How do we connect with the part of ourselves that is quietly watching and that holds our best wisdom? This is part 2 of 4 of "Would You Listen to Yourself?" Next: Part 3: "Manager Firefighter Exile"